Art Nouveau architecture was big in Europe, but what effect did it have back in the United States? As this website is all about houses and primarily about houses in the United States I will turn my gaze homeward. To answer that question I am going to bring up two other terms here. The Arts and Crafts movement came to the United States from Great Britain not long before Art Nouveau got rolling. Out of the Arts and Crafts movement a the Craftsman style of home developed. The timing of Craftsman homes and Art Nouveau were almost identical. It was a natural fit for them to marry up and they often did. There was more to Craftsman than just Art Nouveau, but it was common for much of the decoration to be in the Art Nouveau style. I live in a house with a Craftsman interior, circa 1906, but it is a very plain farmhouse. Nothing as fancy as Art Nouveau adorns it. 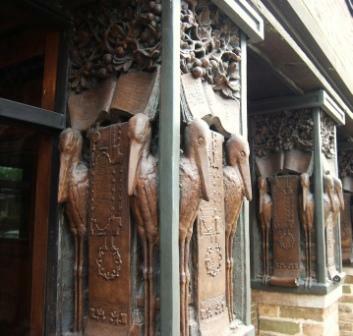 However, I did stay at a Craftsman bed and breakfast once, in Battle Creek, Michigan and it was stuffed full of Art Nouveau. The windows had Art Nouveau stained glass. Some of the carvings in the woodwork were Art Nouveau. The lamps and switches were all Art Nouveau. It is unfortunate that this house ceased to be a bed and breakfast and doubly unfortunate that I never took photos of the house. 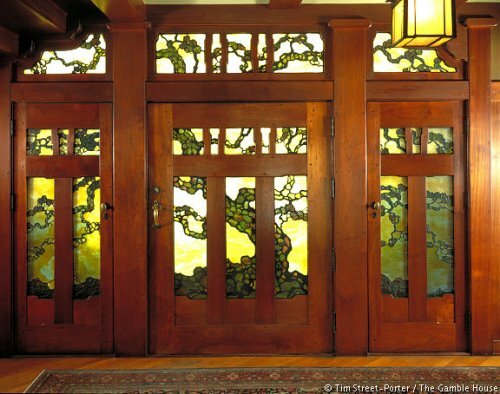 However I will offer a delightful example of a stained glass door designed for the Gamble house. Greene and Greene were the brother architects of this Craftsman mansion and they designed the whole package, from the furniture to the house. While it would not be correct to pigeon-hole the Gamble house as an Art Nouveau house, it has strong Art Nouveau influences, especially in its glass, in its chandeliers and it the detailing around the fireplace. This design is called the ‘Tree of Life’. Art Nouveau architectue can be found throughout the United States in private homes as part of the décor of countless Craftsman homes. While there are fewer icons to the movement in the United States, its close association with Craftsman homes probably means that Art Nouveau architecture is more widespread than in Europe. America does count two important architects who influenced and were influenced by Art Nouveau. Louis Sullivan is credited with building the first modern skyscraper. The Wainwright building went up 10 stories high. The key word here is modern. He jettisoned the classical look and went for something completely different. For ornamentation he used a combination of organic, flowing designs superimposed against strong geometric shapes. The building went up in 1891, three years before Horta finished the Hotel Tassel and four years before Mucha’s Gismonda poster. Some people point to the decoration on the Wainwright and classify it as Art Nouveau architecture. I don’t think that is correct. The strong geometric forms and symmetry gives a different look than you usually find in Art Nouveau, but he was breathing the same air as the other Art Nouveau instigators and was headed in the same general direction. 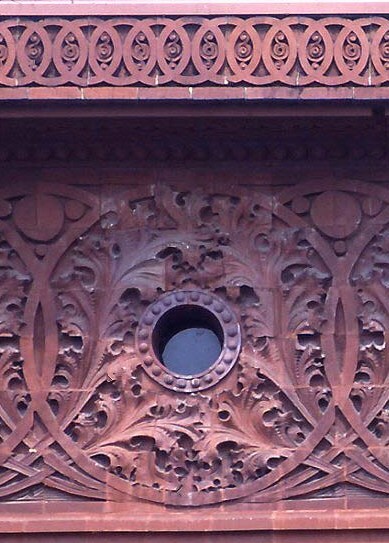 Louis Sullivan made extensive use of a blending of the organic and geometric. In some cases it was very much like Art Nouveau, In other cases it was very original to Louis Sullivan. 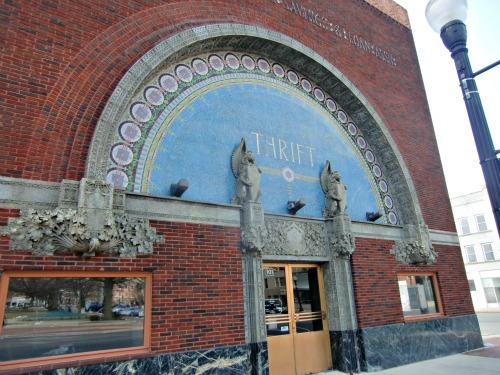 The entrance to the People's Federal Savings and Loan Association, built in 1917, shows a mixture of the flowing and the geometric, traditional and modern. The classic arch directs the weight right down into the middle of the flanking windows, a feat impossible without a steel structure. Most importantly he was trying to find a decorative theme appropriate for soaring architecture and he struck upon something that wasn’t far from either Art Nouveau or the Art Deco that would take its place. His pupil and protégé was a man called Frank Lloyd Wright, who would take his teachers ideas on architectural decoration and build upon them. In some ways, while very much a proponent of the Arts and Crafts movement, Wright was at odds with Art Nouveau. You won’t find much in the way of long flowing curves in his architecture or his art after he found his own voice. His early work contains a lot of decoration similar to Sullivan’s, but after a few years he abandoned that style, dropping the organic forms and focusing on the geometric designs. In doing so he really bypassed Art Nouveau and went straight to the next step. If you look at the windows on his 1901 Bradley house you find yourself looking at an Art Deco window, a style that really wouldn’t come into its own until twenty years later. So with that I will wrap up my series on Art Nouveau architectue and segue into my articles on Art Deco. I love these columns. These are at the entrance to his offices in Oak Park, Illinois. I don’t know if you can categorize these as Art Nouvea. They are just strange, but incredibly interesting. These windows are actually from the Robie house, a much later house, but not all that different from the Bradley house windows. 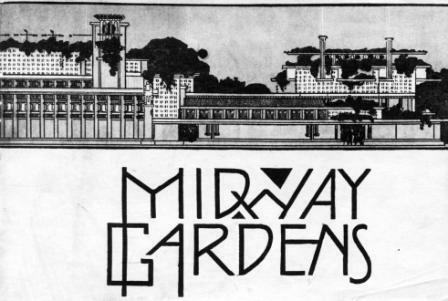 Wright’s drawings are a visual treat, in part because of the wonderful fonts he used. In this he was very much in keeping with the Art Nouveau and Art Deco styles.